Last Saturday Barry was able to score us some Jazz tickets. 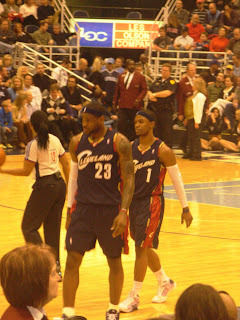 We were lucky enough to see them loose to the Cleveland Cavilers. 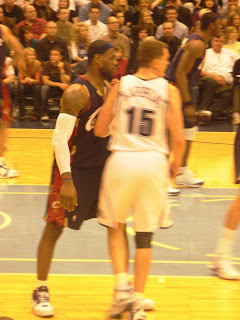 This is the second time I have had the privilege to see King LeBron play the Jazz. The first time we in the upper bowl. This time, we had 5th row tickets. If you were watching the game on tv and were paying attention, you would have seen us behind the Cav's bench. It was amazing!!! Not only did we get to see one of the greatest NBA players but we got some awesome tickets. My husband has the BEST job ever!! !